God’s care and kindness even when rejected. Strong parenting images. God as a lion roaring, and his children returning with trembling. God's longing for us. NCH583 / GtG044 / StJ Like a mother who has borne us (Bechtel) This has very appropriate lyrics. The tune is gentle, soothing and simple. Sound sample. Lyrics (downloads a pdf). Tune in The God that I Know (Anderson) A beautiful ballad with female and male images of a loving, embracing God. Sound sample, sheet music sample and songbook. TiS 693 / AoV1-031 / GA212 Come as you are that's how I want you (Browne) This song is beautiful, gentle, simple, and very well known. Lyrics (search for "come as you are"). Slow and mushy sound sample. A good song to start the service. *AoVNG55 / Taizé / G(3)959 / SP323 / Lau221 God is forgiveness / Bóg jest miłością (Taize) "God is forgiveness, love and do not fear". A simple Taize chant which seems to suit this reading quite well. Sheet music, lyrics in many languages, sound samples. ATW 459 I don't believe in a God up in the sky / God Version 1.0 An excellent rock song about how we think about God, or not! Lyrics and mp3. Good for kids. *AoV1-030 / GA213 / G(II)282 / GC386 / GC(II)405 / G(3)484 / Lau842 Come back to me / Hosea (Norbet) Quite beautiful song of return to God. Nice sung sound sample. Lead sheet. God’s steadfast love, satisfying the thirsty and filling the hungry with good things. Provider. TiS 67 Give thanks Give thanks to the Lord (O'Brien) A cantored Psalm with a response that is actually fun and happy! The verses could also be read, rather than cantored. *Taizé / MV016 / StJ / ELW528 / GA430 / SFFS 2157 / HPP410 / GtG466 / G(II)398 / GC570 / GC(II)550 / G(3)637 / CP402 / URW378 / Lau701 Come and Fill our hearts/ Confitemini Domino (Taize) Can be sun in English as "Come and fill our hearts with your peace, you alone O God are holy. Come and fill our hearts with your peace, Alleluia". A good song of recommitment. Obviously if you don't sing Alleluias during Lent, this is not for you. 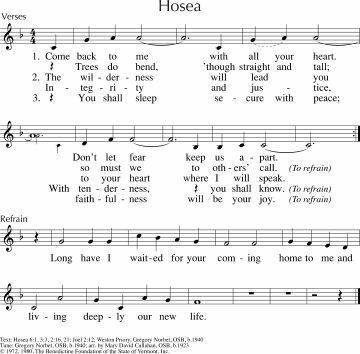 You could replace the Alleluia with Hosanna if you really want to sing it. Sound samples and sheet music. AoV1-074 Come To The Water (Andersen) A beautiful song about God providing (from Isaiah 55). Familiar to many, but easy to sing if not. Works well for communion also. Lyrics and sound sample. Tune In / ATAR598 / NCYC 2009 God has laid a feasting table / Invitation (Whelan). Feminine imagery of God gathering her guests to a feasting table. Fun Cuban rhythm. Sample and songbook. ATW 475 Come to the banquet there’s a place for you (White) An excellent song by Melbourne singer and songwriter Faye White. Lyrics (scroll quite a bit). Good for kids. AoV2-020 / ATAR665 Come to the feast of Heaven and Earth / Table of Plenty (Schutte) “God will provide for all that you need, here at the table of plenty”. I love this song. It’s very straightforward and excellent words. Emergent Psalter / PfAS107C May those who are wise (Everett) A good Psalm refrain, with two possible options for alternate refrains. Will need to be taught. Sheet music (refrains only). Tune In: Kingdom Come (Lees). A song about what the kingdom might be like, with plentiful images from the parables. Sample and lyrics. *Online resource: Your New Shalom (Harding) A simple song with 4 verses, including “your desert will bloom again”, with a last verse of “We bring in your new Shalom”. This would work well at any point in the service, including the final song.... or even interspersed throughout. Sheet music sample available, and you can purchase a pdf here. WCC website Hear the message we now are proclaiming / El mensaje que hoy proclamamos. This jubilant Colombian song of liberty and new life for the poor and suffering would fit well with this reading. Good for kids. Free sheet music! The vanity of human toil, and passing on one's work to the next generation. I just don't know what to suggest for this reading, except what I've listed for the Psalm! PfAS049B Come one and all from near and far (Leckebusch) I think this would be best sung, slowly, by a soloist (or two), with no accompaniment, or very simple rhythm on xylophone. Emergent Psalter When the rich die they take nothing (Everett) A simple Psalm refrain. Sheet music (refrain only). Focus on things above, put to death earthly sins. Neither Jew nor Greek…. TiS 398 / AHB 310 / AoV1-118 / NCH289 / CH489 / UMH475 / VU367 / GA375 / A&M238 / LBW508 / ELW804 / GtG282 / PH313 / GC465 / GC(II)471 / G(3)556 / RS617 / CP645 / CP(E) 175 / W&R330 / Cha582 / Srce100 / Lau303 / StF372 / MP089 Come down O Love divine (Williams) Old fashioned, but still inclusive and very well known. Words and tune. Hymnals vary a lot in the lyrics with respect to thees and thys and words like "vesture". Oldy-but-a-goody. TiS 387 / CH416 / UMH318 / VU158 / LBW363 / ELW389 / A&M199 / GtG246 / PH108 / CP(E) 140 / W&R312 / 82Hml-182 / Lau272 / StF297 Christ is alive Let Christians sing (Wren) Excellent words of Christ's saving, and still relevant grace. A couple of tunes are offered in different hymn books. I prefer TRURO. Lyrics and sound sample. New words to old tunes. MV 162 Christ within us hidden, Christ in all and each (Leunig) Very simple tune with quite remarkable words based on a prayer by Michael Leunig. Why is this in a Canadian song book and not any Australian song books?!? Verse 4 and 5 are particularly appropriate for this week’s reading “Christ, in bodies broken, Love new crucified. Christ, the Word new spoken, death by love defied; Christ, in love recovered. Christ, in hope revealed. Christ, in faith discovered. Christ in tombs unsealed”. Worldmaking.net Hidden with Christ (Bruxvoort-Colligan) "Hidden with Christ, hidden with Christ, all of us deep within God’s love". Tune is simple enough for first-time singers. Sample, songbook and lyrics. TiS 610 God you touch the earth with beauty (Edgar) A bit mushy, but nice. TiS 179 / NCH273 / VU312 / GA379 / StJ / URW073 Praise with Joy the World's Creator One of my favourite hymns - strongly Trinitarian lyrics and excellent imagery. I particularly love the “One God in community” phrase. Some versions change "Son" to "Christ" to make it more inclusive. Lyrics (scroll down). New words to old tunes. *CH355 / VU210 / HPP81 / GtG274 / GC(II)525 / G(3)628 / CP630 / W&R99 / URW098 You Lord Are Both Lamb and Shepherd (Dunstan) Beautiful words. Can be sung to many tunes. I like it to PICARDY or WESTMINSTER ABBEY. Sound sample, lyrics and sheet music sample here. New words to old tunes. Tune In: Making things new (Anderson). A groovy one. Great for kids, and lots of fun. Reference recording, lyrics and songbook. Good for kids. *ATW 463 / Iona (T1AU) / ELW721 / SFFS 2219 / A&M835 / GtG750 / GC(II)451 / G(3)528 / W&R296 / URW436 Goodness is stronger than evil (Tutu / Iona) Words from Archbishop Desmond Tutu. "Victory is ours, victory is ours, through him who loves us". Some congregations change the last line to "Compassion is ours, compassion is ours...". It depends on the context in which you sing it, I suppose. Sound sample. Good for kids. Greed is bad; losing sight of God while hoarding. Online resource: Bigger Barns (Winfrey-Gillette). Really good lyrics, and the tune, a standard, but unfamiliar hymn tune (TiS 211(i) is a really straightforward alternative). Lyrics. *Taizé / TiS 739 / AoV2-041 / ATOK 404 / VU290 / GA269 / SFFS 2054 / GtG820 / G(II)451 / GC639 / GC(II)626 / G(3)733 / CP568 / W&R421 / URW388 / Lau947 Nothing Can Trouble / Nada te turbe (Berthier) Excellent and quite well known Taizé chant. Spanish lyrics are not too hard for non-Spanish speakers. Sheet music, sound samples, lyrics and translations. Good for kids. GtB / On the Road God is love and love is giving (Langmead) A simple kids' song about God's love. A round. Good for kids. *AoV2-065 Returning Our Gifts to the giver of life (Porter) Good as an offering song. Seeds of Faith I've got a gift in my heart (Bruxvoort-Colligan) A nice song for kids. Lyrics, sound sample. Good for littler kids. NCH590 / CH621 Spirit of Jesus, if I love my neighbour. Challenging words of offering help from a position of privilege and seeking to be set free from the entrapment of possessions “If I am hugging safety or possessions, uncurl my spirit as your love prevails, to join my neighbours, work for liberation, and find my freedom at the mark of nails”. Could also be sung to the tune PERFECT LOVE if your congregation would have trouble with the newer tune. New words to old tunes. What will you be singing for these readings? Please join in and add your comments below! Written in Hong Kong Airport! "How vain is all beneath the skies! How transient ev'ry earthly bliss! How slender all the earthly ties That bind us to a world like this!" and then 2 or 3 other verses depending on the hymnal source and tune. The author is David E. Ford, text published 1868.